Are you struggling to get links? Then you probably don’t have anything on your website particularly deserving of links. The truth is: there are certain “types” of content that earn links much more easily than others. This is the link profile for “13 reasons your brain craves infographics” by NeoMam. But “linkable assets” are not created solely to attract links. There are a ton of other benefits such as social shares, brand awareness, monetization, etc. In this article, we’ll be looking at what types of content work well as “linkable assets,” how you can create such content yourself, and how you can earn links with them. A “linkable asset” is a piece of content purposely crafted with the intention of attracting links—usually from other websites in your niche. Because people rarely link to commercial content, “linkable assets” are almost never product pages or commercial content of any kind. Some people also create “linkable assets” with the intention of ranking for high‐volume keywords. However, this only works if there is overlap between the topic of your “asset” and one or more high‐volume keywords (which isn’t always the case). Increased organic search traffic (to other pages on your site): Linkable assets tend to attract a lot of “link equity” which you can then distribute to other pages on your site via internal links. This can help those pages to rank higher for their target terms. Increased referral traffic: Links help people to navigate their way around the web. Thus, if you’re getting links from other high‐traffic websites in your niche, referral traffic will likely increase. Increased brand exposure and affinity: Imagine having your brand (e.g., Ahrefs) talked about on some of the most well‐known, high‐traffic websites in your niche. PR firms would charge you a small fortune for such a privilege. But this is exactly what happens when you create a popular “linkable asset.” This helps to spread the word about your brand and causes customers to associate your brand with cool things. Here is one great example of a very simple “linkable asset” that performed well and attracted tons of links. When this infographic was published, the number of referring domains shot up like a rocket! This page now receives an estimated 1,500 visits/month from organic search as it ranks for some pretty juicy keywords. You can also see a steady increase in sitewide organic search traffic since the infographic was published. We’re not claiming that this infographic was solely responsible for this increase in sitewide organic search traffic. We can’t say that. There are many variables at play. But it almost certainly helped. But what makes a “linkable asset” so linkable? First, you need to understand why people tend to link to things. If you can understand that, you can then start building “linking triggers” into your content. It is something their audience would find interesting. But before we get to the asset “types,” it’s important to understand that linkable assets don’t attract links out of thin air—you need to promote them to make this happen. Linkable assets have a much higher ROI on your promotion efforts because they’re created with attracting backlinks in mind. Or, to put it simply, you’ll have an easier time building backlinks to a “linkable asset” than, say, an ecommerce page. So, without further ado, let’s learn about the best types of linkable assets you can create (according to your goals and resources). Infographics are still one of the most popular content formats when it comes to creating “linkable assets.” And it’s easy to see why: they can attract a lot of links. But it’s important to note that infographics are not always the best option. You should only use infographics when the content benefits from being presented in a highly visual format. But how do you build links using these types of assets? Imagine if you had a list of websites in that your niche that had featured infographics in the last X months. That would be a pretty good list of prospects, right? Enter a keyword related to your niche into Content Explorer (e.g., SEO. Link Building. etc.). Then add “[infographic]” in quotation marks. Select “In title” as the location for the keyword. Next, filter the list to show only results published in the last 12 months. And tick the “one article per domain” checkbox. You can choose a more recent timeframe if you like. But this will produce fewer results. 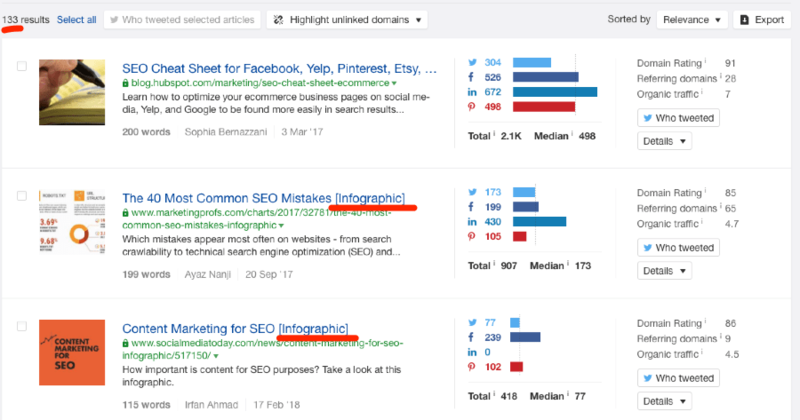 If you do this for the keyword “SEO,” you should now have a list of 130+ websites that have featured similar infographics in the last 12 months. 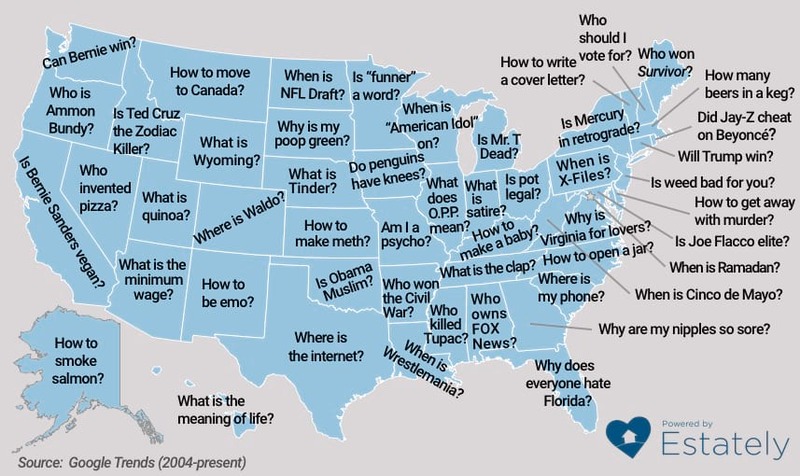 Reach out to these sites and pitch your infographic/map‐o‐graphic/etc. If your asset is high‐quality enough, you could also trying pitching any sites that are interested in the overall topic. They may feature and link to it anyway, even if they don’t usually publish infographics. Remove all current filters (as outlined above). Then sort by the number of referring domains. This is great for brainstorming infographic ideas that are likely to attract links. 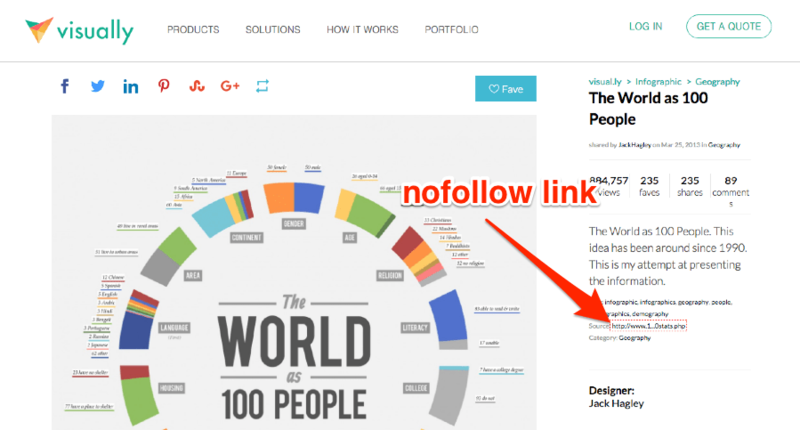 “The 40 Most Common Link Building Mistakes,” anyone? Or you could even “skyscraper” graphics that have a ton of links…yet aren’t so great. It has 50 referring domains, according to Ahrefs’ Site Explorer. 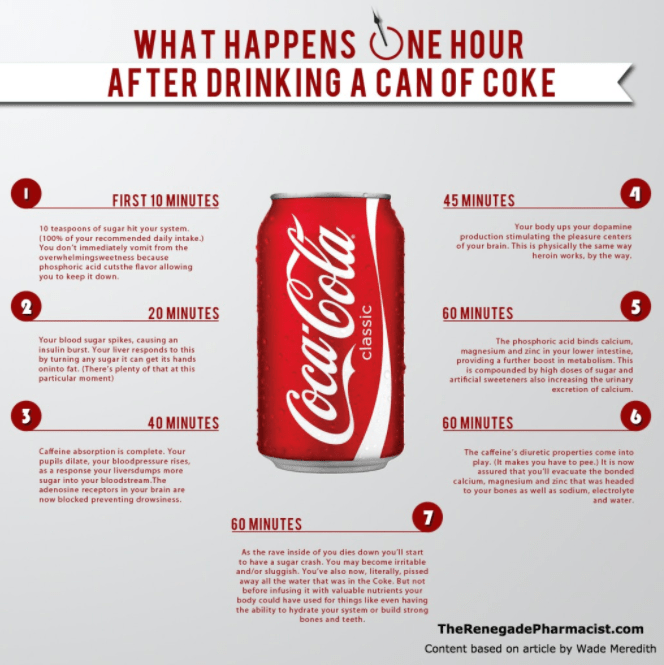 This is a proven infographic concept that you could easily copy in almost any niche. And because it performed well (i.e., attracted a ton of links) in one vertical, chances are the concept will appeal to those in other verticals. But how do you find infographics that have performed well in other verticals? Use Content Explorer in the same way that I outlined in the previous tactic. But use a keyword unrelated to your niche instead. 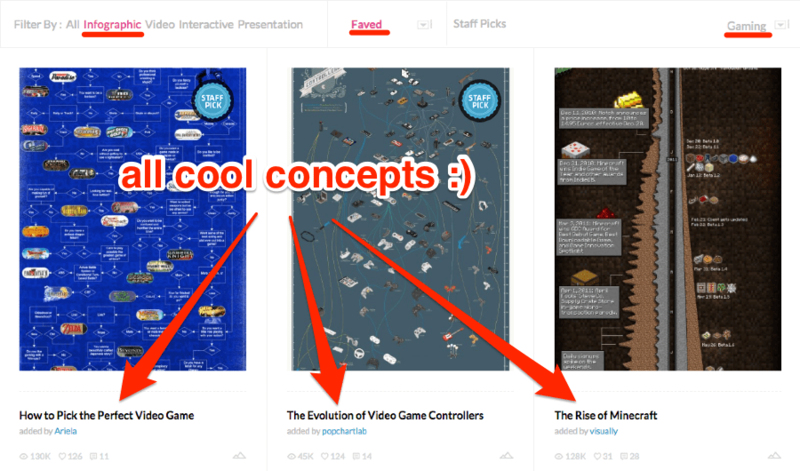 Or you can search sites like Visual.ly or Pinterest for popular infographics in other niches. Infographic directories (e.g., visual.ly) can bring a few extra links to your graphics—you just have to submit your graphic to them. Unfortunately, though, these links don’t tend to be worth much, and a lot of them are nofollowed. Therefore, we don’t advocate this as a primary tactic in 2018. 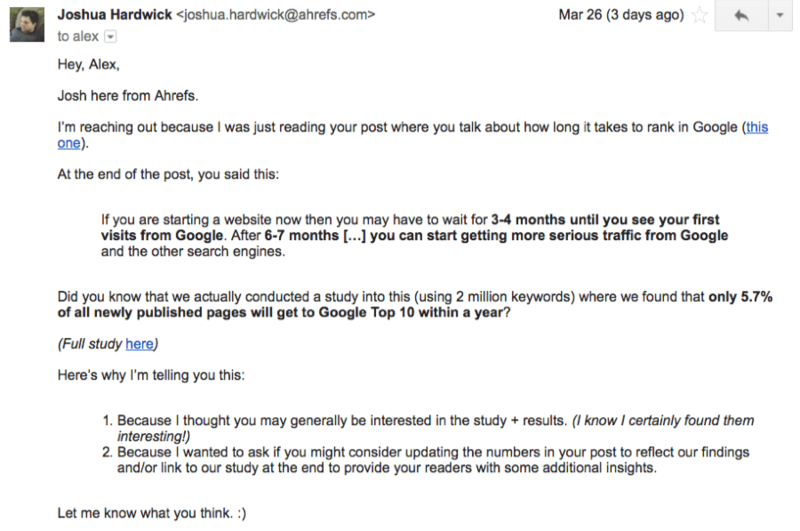 But it’s still worthwhile as an extra tactic, especially for brand new sites that don’t have already any links at all. Online tools and calculators have the potential to attract a LOT of links (and I do mean a lot). Yes, you read that correctly—16K+ links from 3.6K+ referring domains. But it’s worth noting that the barrier to entry is quite high with this type of content. You either need a decent budget to hire a coder/designer/etc. Or you need to have such skills yourself. But what tactics can you use to build links with them? Tools and calculators generally provide shortcuts to more complex problems. For example, take the “Alcohol By Volume ABV Calculator” that I mentioned above. This tool allows homebrewers to calculate the alcohol content of their beer using two figures: original gravity (OG) and final gravity (FG). You don’t need to understand precisely what these terms mean. Just know that they’re common knowledge to most homebrewers. Without such a tool, brewers would have to calculate this figure manually using a mathematical formula. This formula is talked‐about on many websites. I’m sure readers of this article would find a link to an online calculator super‐useful. And I think it would also fit perfectly in this section of the post. If we were to reach out to the blogger and suggest that they add a link to this online calculator, it would probably be a pretty easy sell. And a quick search on Google reveals tons more web pages that would make excellent prospects. But if you’re doing this at “scale,” you’ll need to scrape these prospects. Right? Why? Because they often solve a genuine problem that people are already talking about—thus making the addition of a link to the solution (i.e., your tool) a natural next‐step. That’s why paid promotion—via PPC ads, such as Facebook ads—can indirectly result in a ton of links. 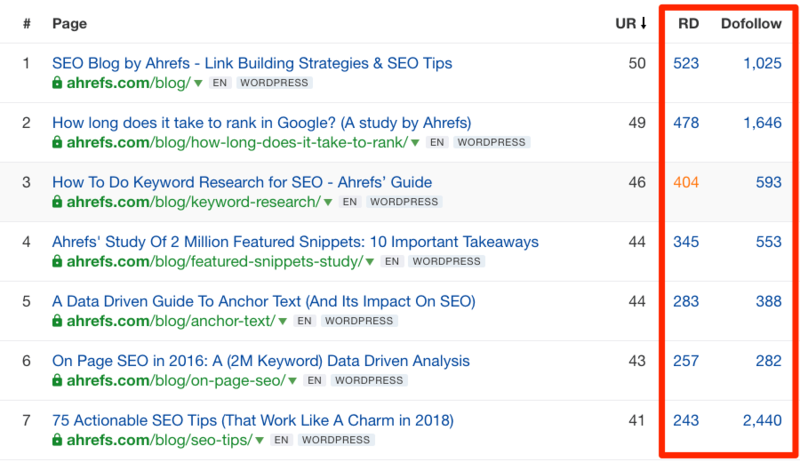 We do this for most new posts we publish on the Ahrefs blog. And we attract a ton of links as a result. Online tools and calculators are also well‐suited to so‐called “resource page” outreach. I won’t go into detail on this tactic (as it’s been covered thousands of times already—see here). But basically, you find pages that link to a ton of resources on a particular topic, like this one. Then you reach out and pitch your tool or calculator for inclusion. This is an excellent way to build a few extra links to your tools/calculators. For awards/rankings to work as a “linkable asset,” you need to have a certain amount of authority and credibility in your niche. We recently created a ranked list of the 65 best marketing articles of all time. Even though it’s only been live for a few months, it’s already attracted a fair few links. But here’s the thing: we never intended for this to be a “linkable asset,” and nor did we frame it as such. In fact, it’s just a regular ol’ blog post; we didn’t make it interactive or give out awards badges, we just created a list of ranked articles. So why did this “work”? Now, imagine that I instead published this same piece of content on my personal blog—a blog that’s been left derelict for over a year. Do you think anyone would see this “award” as meaningful? Probably not. Find 100 influential people in your industry and create awards list based on their votes. Much like with online tools and calculators, nobody is going to link to your awards/rankings page if they don’t know it exists. So start by telling everyone who either “won” an award, or was featured in your rankings. 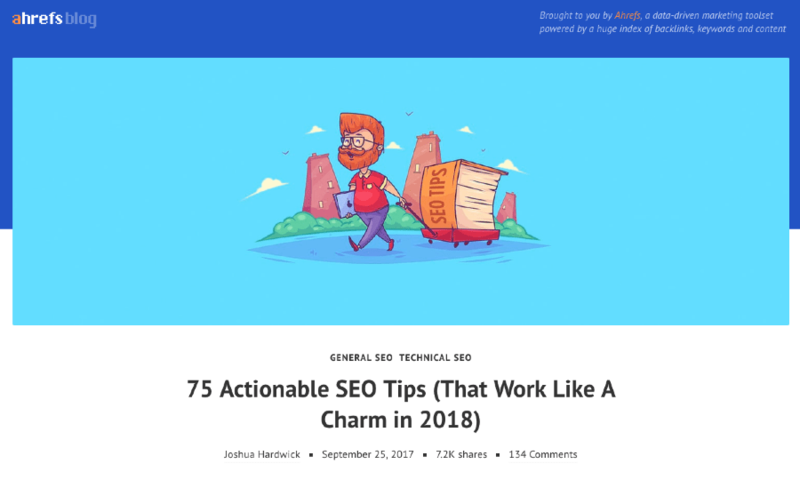 For example, this post by Ryan Stewart was rated as one of the best link building articles in our list of the best marketing articles. Did Ryan link to this article? Not this time. But because Ryan shared it with his 8K+ fans on Facebook, it increased awareness of the post throughout the SEO and marketing community. Remember, awareness is the first stepping stone in the journey towards any link. Nine times out of ten, they’ll add it (along with a link). I‘m aware that I already covered Facebook ads (i.e., PPC) as a tactic in the last section. But this is a deeper, more specific tactic that is better‐suited to this type of linkable asset. 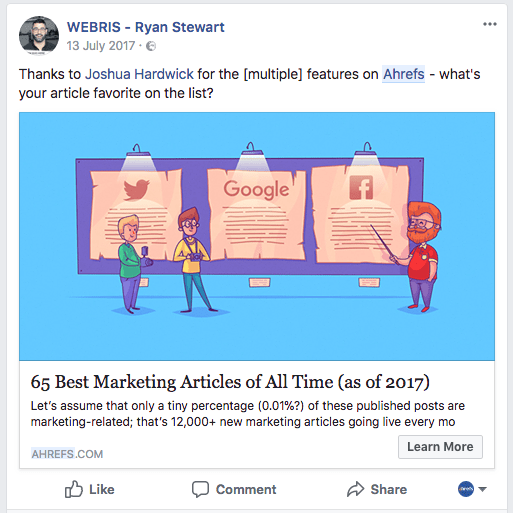 Sometimes, the people you feature on your list of awards/rankings will share your post with their audience (as Ryan Stewart did with our list of the best marketing articles). But sometimes they won’t. Under the “detailed targeting” section in Facebook Ads, search for the associated pages of the websites/people to whom you gave awards. For example, ViperChill, Neil Patel, and Copyblogger were all featured on our list of the best marketing articles. So we could target fans of those pages on Facebook. This works because people who love, say, Glen Allsopp’s content (ViperChill) may be interested in reading similar material on other blogs, such as Ahrefs. And if they ever need to recommend a good list of industry‐related blogs or articles in future, they will likely link to your awards page. Studies and original research pieces attract links like CRAZY in some industries. The SEO/marketing industry is a prime example of this. In fact, four of the five most linked‐to pages on our blog are studies. People trust us: Ahrefs is a trusted and well‐known brand in the SEO/marketing industry. So people trust our studies. The result: lots of backlinks. 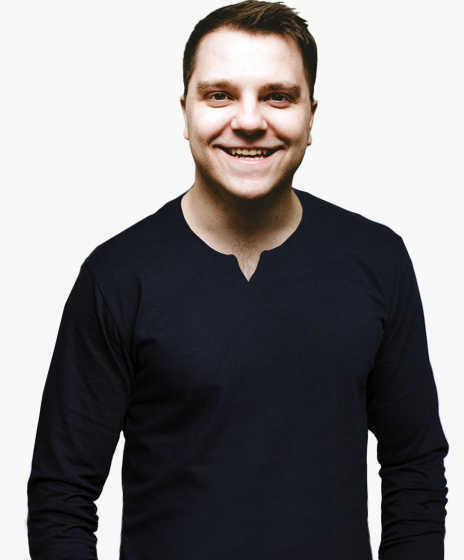 We offer unique data and insights: Our business is based on data, so we have heaps of it. This gives us an advantage over our competitors—we can create data‐driven studies using data that nobody else has access to. But what if you’re not so well‐known in your industry? And what if you don’t have heaps of data to play with? Well, the good news is that you don’t have to base studies and research‐type posts on insane amounts of data (like we do). In fact, personal case studies can also work well. Here’s one that attracted a fair few links. But how can you build links to these types of assets? Sometimes, studies will attract a ton of links. But then they won’t be updated for years. For example, Moz’s haven’t updated their search engine ranking factors study since 2015, yet it still has 68K+ links from 5K+ referring domains. It’s out‐of‐date. But Moz recently announced that they have no plans to update the study. So what do you think would happen if someone else reconducted and updated this study for 2018, then reached out to everyone linking to the old Moz study? Chances are they’d get a ton of links, right? But how do you find outdated studies in your industry? Leave the location as “In content” this time. No need to change it to “In title”. Then sort the results by # of referring domains. Look through the results until you find something promising. You’re looking for a study of some kind that’s out‐of‐date and has a ton of referring domains. Reperforming this study in 2018, then reaching out to everyone linking to the original would undoubtedly yield a ton of links. Not everyone on the internet seeks proof before writing about a topic. 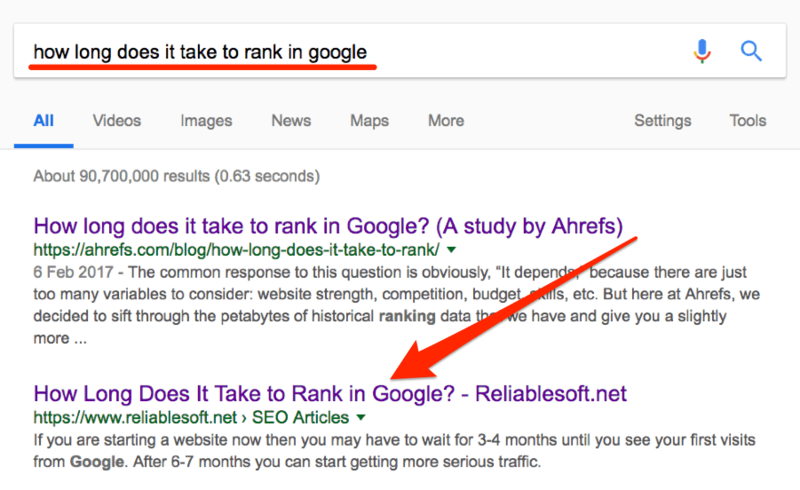 Case in point: the amount of time it takes to rank in Google. We conducted a study on this a few months back. It proved very popular—in fact, it has already acquired links from hundreds of referring domains. But many people have written about (and given then opinion on) this topic before. These timeframes are based on nothing but the author’s personal experience—they aren’t data‐driven numbers. But let me ask you a question: do you think a link to our study would make sense in the context of that article? Good answer 🙂 So what if we were to reach out to this guy to let him know about our study, and perhaps even suggest that he update his post to reflect our findings? I guess the likeliness of him linking to us would be pretty high, right? Sure, he didn’t add it to the post I suggested, but a link is a link, right? But anyway, you’re probably wondering, how do you find people talking about the ideas on which you based your study? Most things worth learning are reasonably complicated. That’s why so‐called “definitive” guides tend to get a ton of backlinks. Bloggers and journalists would much rather link out to one definitive guide or tutorial than a bunch of different resources. But to pull off a “definitive” guide, you need to be an expert on the subject matter. That’s why our guides at Ahrefs perform so well when it comes to link acquisition—e.g., Tim’s outreach guide. We’re a trusted brand in our industry with a lot of unique data and insights to share. That’s why people link to us. Bloggers and journalists frequently need to reference good guides on specific subjects. This is why “definitive” guides tend to attract so many links. Therefore, the best way to acquire links using such assets is merely by staying on the radar of potential linkers (i.e., the “linkerati”). But how do you do this? Simple. Keep your guide regularly updated. Then re‐promote it each time you update it. For example, check out our list of SEO tips. But we’ve updated this guide a couple of times over the years. The result? A guide that’s always on the radar of potential linkers. Just as people start forgetting about it, we refresh it and repromote it. You can see a clear spike in referring domains each time we updated this post. Telling our subscribers: There are over 46,000 people on our email list. We let these people know whenever we issue significant updates to existing posts, which results in a lot of awareness. Running Facebook ads: We spend $200–300 promoting our posts on Facebook whenever we update them. Sometimes we target existing fans of our brand. And other times we’ll run retargeting ads (or even target a cold audience). Performing outreach: Never overlook the power of outreach. We perform a fresh round of outreach whenever we make big updates to posts. This isn’t really about asking for links outright (although we sometimes do); it’s more about staying on their radar and letting them know about our content. Everything mentioned above works for tutorials, too. For example, if you have a HTML tutorial, make sure to update and repromote it whenever HTML6 gets released. If you’re putting a lot of work into creating industry‐leading guides (as you should be), then your guide is almost certainly better than most other guides on that topic. 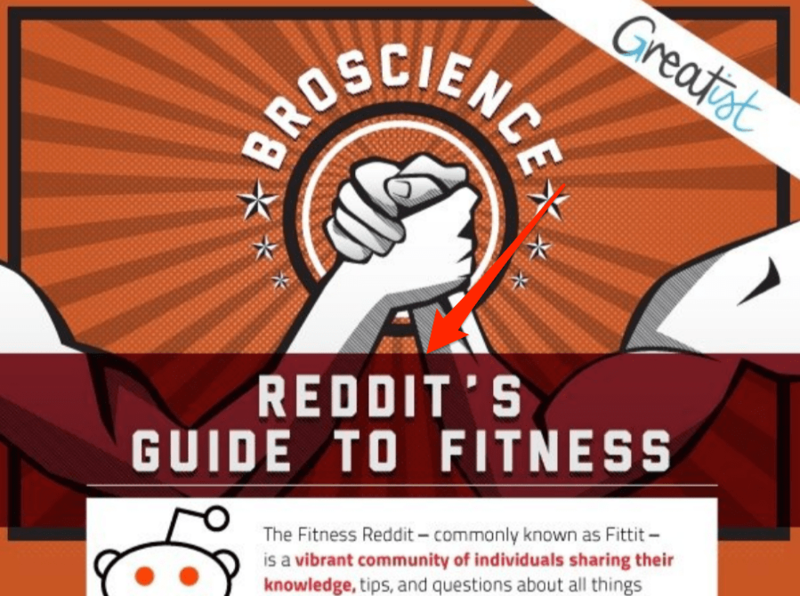 So let me ask you a question: why would anyone want to link to an inferior guide? But because your guide didn’t exist until now, they had no choice but to link to a less definitive guide. However, if you tell them about your new, better guide, chances are they will link to yours instead—thus, you can steal links from less definitive guides. Go to Keywords Explorer and paste in the title of your guide/tutorial (e.g., if we were doing this for Tim’s epic keyword research guide, we’d enter “how to do keyword research for SEO”). Then scroll down to the “SERP overview” section. This tells you details about each of the top‐10 ranking pages. In most cases, the top‐10 ranking pages will all have a good number of backlinks. You can see that this is the case here, with guides from Moz and Hubspot having 1–2K referring domains. This is a lot of potential links to steal. 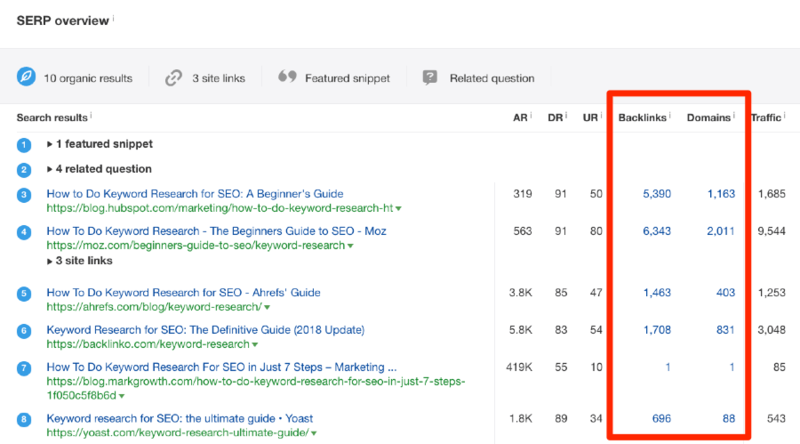 For example, Hubspot’s guide to keyword research is decent. But we don’t think it’s anywhere near as comprehensive and detailed as ours. (Sorry, Hubspot). It’s aimed more at SEO newbies. All that’s left now is to export the referring domains pointing to this page. Then tell those people about our guide. Rinse and repeat this process for any other less‐definitive guides on your topic (that have backlinks). Remember, the aim here is to let people know about your definitive guide. These people have already linked out to a similar (albeit less‐definitive) guide in the past, so you don’t need to give them the hard‐sell. Just tell them about your newly‐published guide and let them know why they should check it out. NOTE. Check out Tim’s outreach guide for more outreach tips. DISCLAIMER. I saved this type of linkable asset until last for a good reason: coined terms are VERY hard to create and pull‐off. BUT, it can be done. If you’re successful at creating such a term that manages to gain significant traction, well, you won’t be short of links for a while! Coined terms don’t need much of an explanation. They’re terms which, before their authors coined them, didn’t exist. For anyone that’s been living in a cave for the last five years, this is a link‐building technique coined by Brian Dean. It has a ton of backlinks. It also continues to attract more and more backlinks as time goes on. In fact, it’s not unusual for this page to draw links from 50–100 new referring domains in a month. “Briefcase Technique” — 370+ links from 90+ RDs. “The Dark Playground” & “Instant Gratification Monkey” (both of these coined terms come from the guide: Why Procrastinators Procrastinate) — 23K+ links from 1.6K+ RDs. Let’s use the “instant gratification monkey” example that I mentioned above. 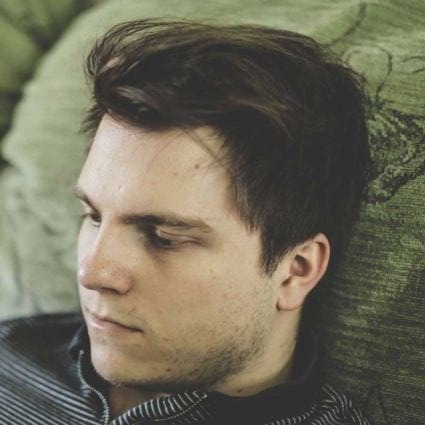 This coined term comes from an article—a damn good one, actually—about procrastination. 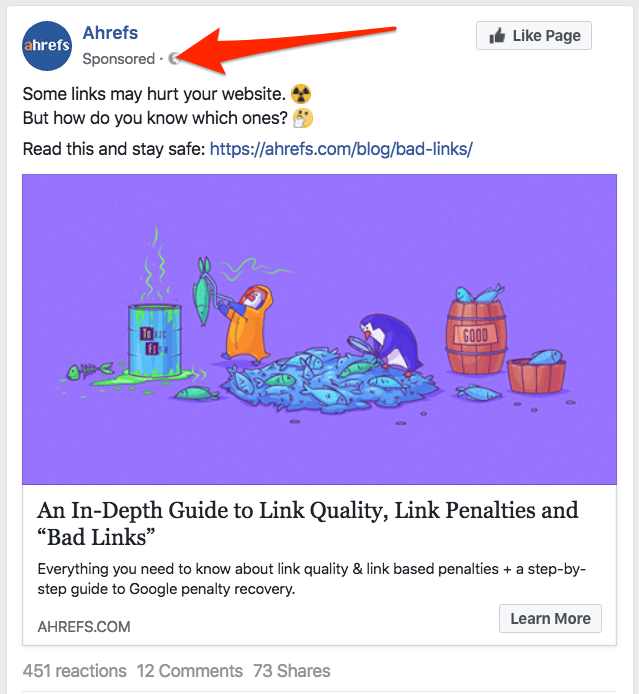 Now, you could set up an alert within Ahrefs Alerts for “instant gratification money,” then reach out to anyone mentioning such that term and ask them to link to you. But here’s the thing: anyone mentioning such a unique term is probably already linking to you. So, 99% of the time, this isn’t going to be much use because you already have the link. Set up alerts for any relevant terms related to your coined term. Then I could reach out and share my unique insights with anyone who’s talking about procrastination. Some of them would almost certainly add my term to the page and link back to me. 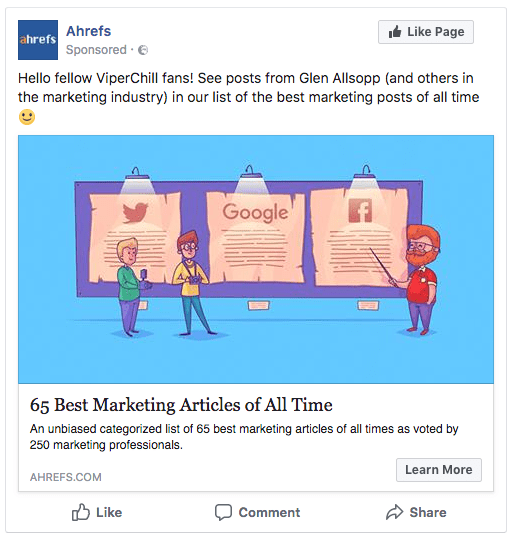 Go to Ahrefs Alerts, hit “mentions,” then add a new alert. 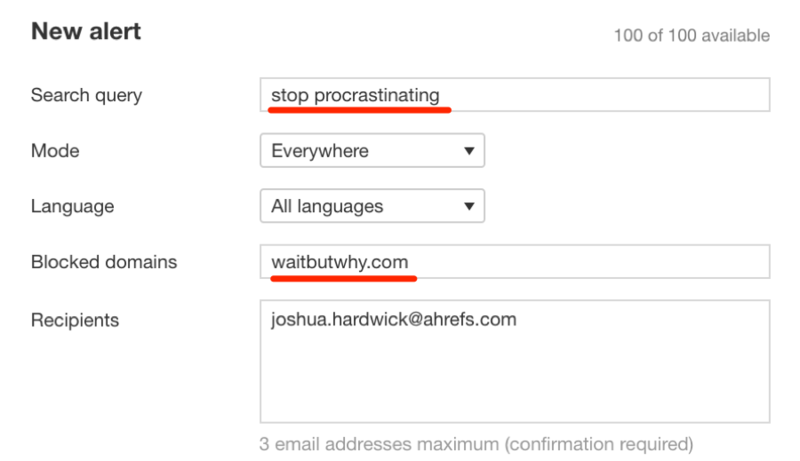 You will now be alerted (via email) whenever someone mentions those terms on the web. All that’s left to do then is to reach out, share your unique approach or idea (e.g., the “instant gratification monkey”) and hope for a link. Guest posting is not a new tactic; people have been writing guest posts for years. But just in case you’re unfamiliar, guest posting is when you write a “guest” post for another website. For example, here’s a post I wrote for Sitepoint 5+ years ago. Most people write guest posts solely for the links (yes, you typically receive a backlink from your published guest posts). But in my opinion, this is a shortsighted tactic. You can use guest posts for so much more. For example, you could write a guest post for a hugely popular website in your industry (e.g., Ahrefs) and mention your coined term in that post. Because the post will likely receive a lot of traffic, this will help to popularize your coined term. And as your coined term increases in popularity, so will the number of links you attract. 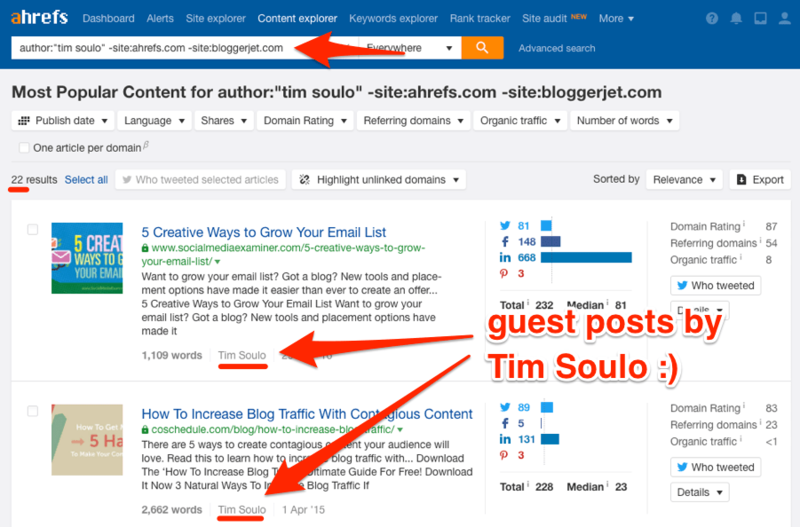 So how do you find high‐traffic industry blogs on which to guest post? These kinds of terms usually result in a LOT of junk: Low‐quality or unrelated sites, PBNs with “write for us” pages that were created solely to attract those desperate SEOs willing to pay for links, etc. That’s why I recommend using Content Explorer instead. All you need is the name of someone in your niche that you KNOW does a lot of guest posting. Let’s use our CMO, Tim Soulo for this example. I’ve excluded both ahrefs.com and bloggerjet.com (Tim’s personal blog) because any of his posts on these two sites aren’t guest posts. Boom! You now have a list of websites in your industry that you know accept guest posts. Because others in your industry have been guest posting on this website, you can bet that these sites will have a decent amount of organic traffic. If you want to double‐check, export the list of URLs from Content Explorer and paste them into Ahrefs’ Batch Analysis tool. Note. Make sure to select the “domain/*” mode in Batch Analysis. Sort the resulting list by “traffic,” and you’ll have a list of sites that accept guest posts with a ton of traffic. Mention your coined term on one of these sites and awareness will skyrocket. Wow. That was a long one! But before we wrap up, I want to mention a couple of important points. Firstly, I should stress that many of the tactics above will “work” for numerous types of linkable assets. E.g. you can use guest posts to build links to and raise awareness of any kind of asset, such as tools or studies. And you can do the same with Facebook ads. I tried to highlight the tactics that work best for each type of asset above. But as you can see, there is some crossover, so don’t be afraid to get creative. Secondly, you likely realized that a lot of the tactics above focus on letting people know about your “linkable asset” above all else. This is because “linkable assets” are precisely that—assets that people WANT to link to. Thus, your job is to make sure that the right people (i.e., those in your industry that have the power to link—the “linkerati”) know your asset exists. Remember, you could have the best asset in the world, but unless the right people know about it, you won’t get a single link. Got it? Good. Now it’s time to start creating linkable assets and earning links.